We have reached the state semifinals in the 11-Man classes of Kansas high school football, and the 8-Man classes will decide the state champions this week. Kpreps will continue to post state rankings throughout the playoffs culminating in our final poll after the state champions are crowned. Let’s take a look at the Kpreps.com rankings for November 17th. Check out our complete Rankings for further details. In Class 6A, the highly anticipated showdown between No. 1 Shawnee Mission East and No. 2 Olathe North will take place this week with the winner advancing to the 6A championship game. Olathe North bested No. 3 Blue Valley 27-14 in the 6A quarterfinals on Friday. Lawrence Free State moves up to No. 4 this week after defeating Junction City. The Firebirds will take on new No. 5 Hutchinson to decide the 6A title game participant from the west side of the bracket. Shawnee Heights enters the Class 5A poll at No. 4 this week after eliminating No. 5 Pittsburg 34-14. The T-Birds will take on No. 3 St. Thomas Aquinas for a spot in the 5A state championship game. Aquinas moves up into the third spot after beating Leavenworth. Bishop Carroll remains No. 1 and will travel to No. 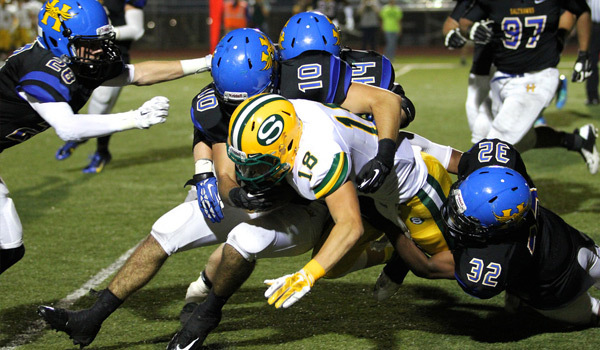 2 Salina South to decide the west representative in the 5A title game. There are no changes to the 4A-I poll this week. Top-ranked Bishop Miege shut out No. 5 Fort Scott 47-0 to advance to the semifinals. They’ll take on No. 3 KC Piper which moved on with a 24-14 win over Paola. The other half of the bracket will pit No. 2 Topeka Hayden hosting No. 4 Buhler. The Wildcats beat Mulvane 34-12 on Friday, while defending 4A champion Buhler beat Andover Central 38-14. The 4A-II poll has undergone multiple changes this week as only top-ranked Andale didn’t move in the rankings. The Columbus Titans scored with nine seconds remaining to top Holton 22-21 and move into the state semifinals for the first time in school history. Columbus moves up this week to No. 2 in the poll, just ahead of No. 3 Holcomb which routed Clearwater. The Longhorns will travel to Andale this week in the west semifinal. Holton drops from No. 2 to No. 4 with their loss to Columbus, and the new No. 5 team is Santa Fe Trail. The Chargers edged then No. 3 Frontenac 14-13 to advance to a semifinal showdown at Columbus. For the ninth time in 13 seasons, the War on 24 will decide a trip to the 3A state title game. Silver Lake has won the previous eight semifinal meetings, but the third-ranked Eagles needed overtime to defeat Wellsville 20-14. Top-ranked Rossville won in impressive fashion on the road at St. Mary’s Colgan. The two rivals will meet in Silver Lake this week. The other semifinal features No. 2 Scott City traveling to No. 5 Halstead on Saturday afternoon. The Beavers eliminated No. 4 Wichita Collegiate this past Saturday 26-6, while Halstead dismantled Minneapolis 66-7 in a game that was 66-0 at halftime. Class 2-1A has also seen major changes in the top five. Most notably, last week’s No. 1 La Crosse was eliminated by Ell-Saline 28-12. The Leopards drop to No. 5 in this week’s poll, while Ell-Saline enters the rankings at No. 4. Phillipsburg regains the top spot with their win over Oakley. The Panthers will host Ell-Saline this week in a district rematch. Phillipsburg won the earlier meeting 20-14. Troy jumps three spots to No. 2 this week after an impressive 23-0 shutout of Lyndon. The Trojans will now travel to No. 3 Olpe for a shot to play in the 2-1A title game. The state championship games are set in both Eight Man divisions with the title games to be played Saturday, November 22 at Newton’s Fischer Field. In 8-Man 1, No. 1 Hanover will take on No. 2 Central Plains. The Wildcats beat Osborne for a second time this season. Osborne drops to No. 4 in this week’s poll. Central Plains shutout No. 5 Ness City 32-0 to advance to Newton. Spearville is ranked third in this week’s poll. The Lancers’ season ended 42-40 at No. 2 Central Plains in the 8M-I quarterfinals. The 8-Man 2 title game will feature No. 1 Victoria and No. 2 Argonia-Attica. Victoria advanced to the championship round by beating No. 3 Sharon Springs-Wallace County 28-12, while Argonia-Attica outscored No. 4 Axtell 70-44. In just their second season of a co-op agreement, Argonia-Attica advances to the state title game. Chetopa remains ranked fifth this week after falling in the quarterfinal round to Axtell.